Over the next few weeks, please be advised that there will be temporary parking and bus schedules in place around the medical campus. There will be no U-M bus service or late night Blue Car service between Dec. 25 and Jan. 1, with the exception of the Wall Street Express and Winter Break Northwood (details below). The Bursley/Baits, Oxford Shuttle and Northwood routes will run through the end of day today (Dec. 21) and resume Jan. 2. The Commuter, Crisler Express, Wall St-NIB, Wall St. Express, North-East Shuttle and Med Express routes will run normal service through Friday, Dec. 22 and will resume service on Jan. 2. A special Wall St. Express bus will serve the free parking area at Wall St. between Dec. 26 and Dec. 29 from 6:15 a.m. – 6:07 p.m. daily. There will be no early morning or late night bus service for the Wall St. parking structure. Regular commuter lot parkers (those who utilize the NC90/91, Glazier Way, Mitchell Field, NC78 and Crisler Center lots) are encouraged to park for free in the Wall St. parking structure and Wall St. blue permit surface lots and take the Wall St. Express to/from the hospitals. There will be no bus service for the NC90/91, Glazier Way, Mitchell Field, NC78 or Crisler Center commuter lots between Dec. 23 and Jan. 1. Since there is no evening or weekend hospital bus service, medical center afternoon- or night-shift staff who cannot be accommodated by the special Wall St. Express bus service will be allowed to park at the Taubman North (P2) parking structure during the holiday break (Dec. 22 – Jan. 1). Staff must exit via a patient/visitor lane and show their yellow or orange permit to the parking attendant for a free exit. Please note that Ride Home and Emergency Ride Home will remain available during the holiday season. 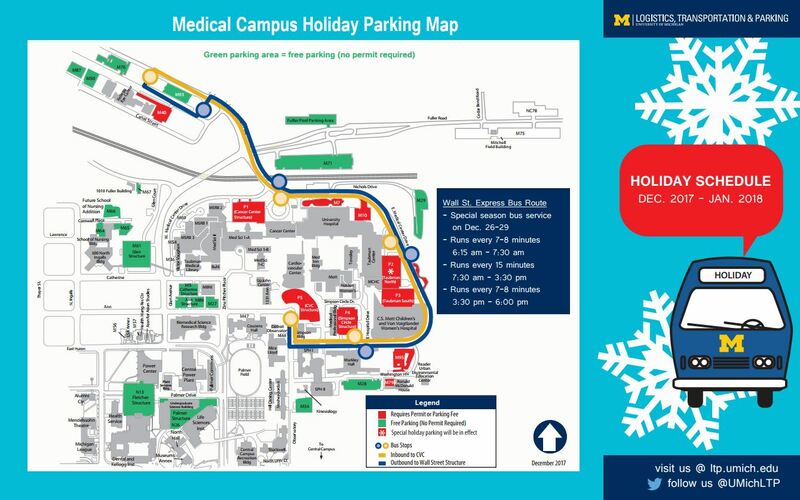 View and print the medical campus holiday parking map, which includes free parking options and detailed bus routes and times. Please share with your colleagues and team members who will be working during the holiday season. Thank you for your cooperation and happy holidays!